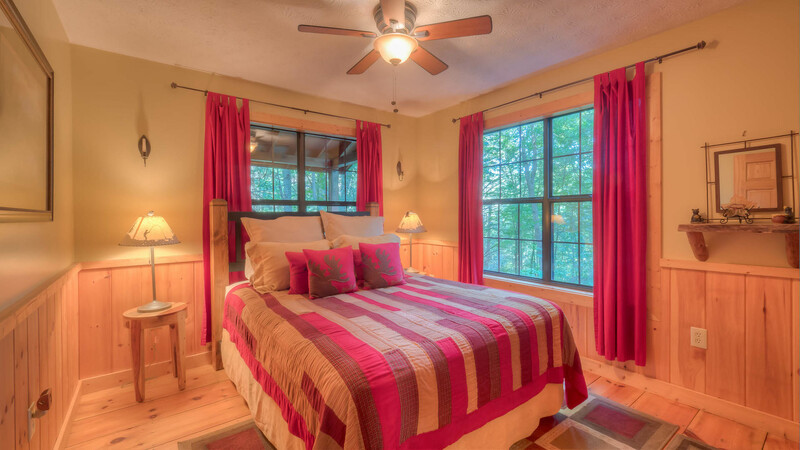 Have you ever dreamed of staying in tree house? 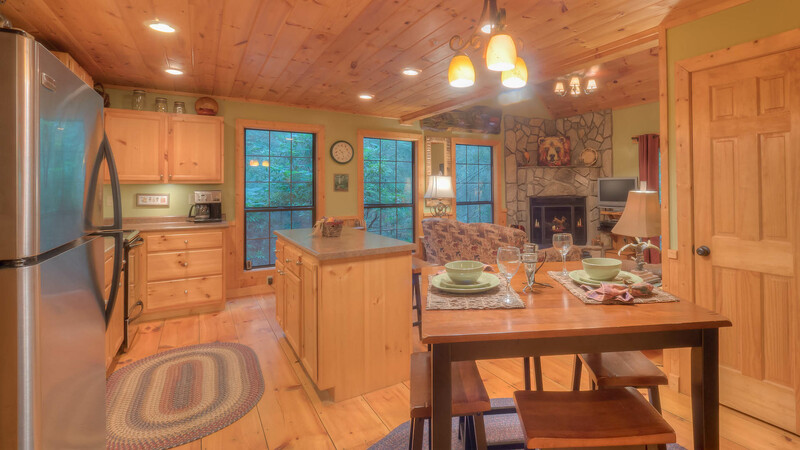 TreeTops is the PERFECT cabin for you! 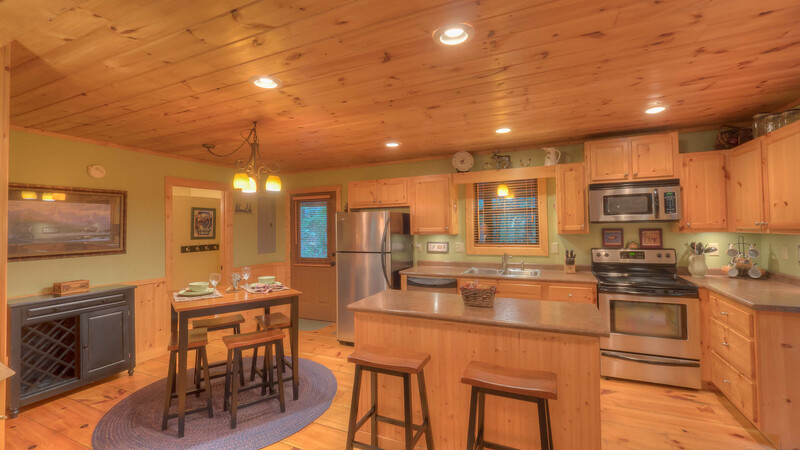 This cabin is located in a private wooded setting in the very desirable Aska Adventure Area. 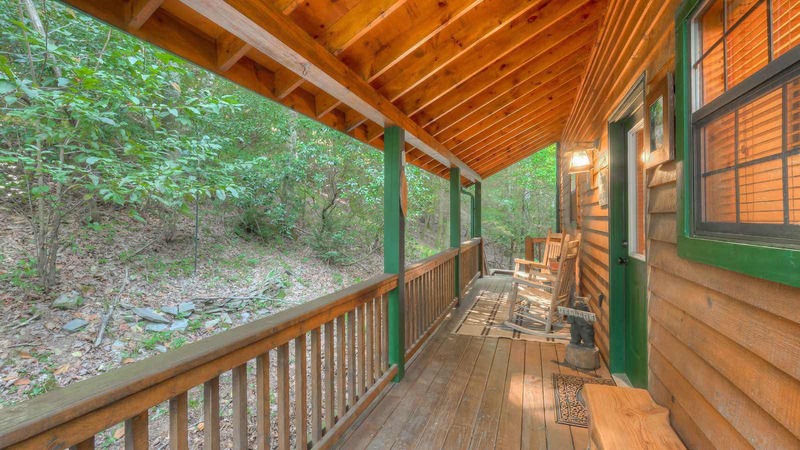 You will be just minutes from the Toccoa River, Lake Blue Ridge and several hiking trail heads. 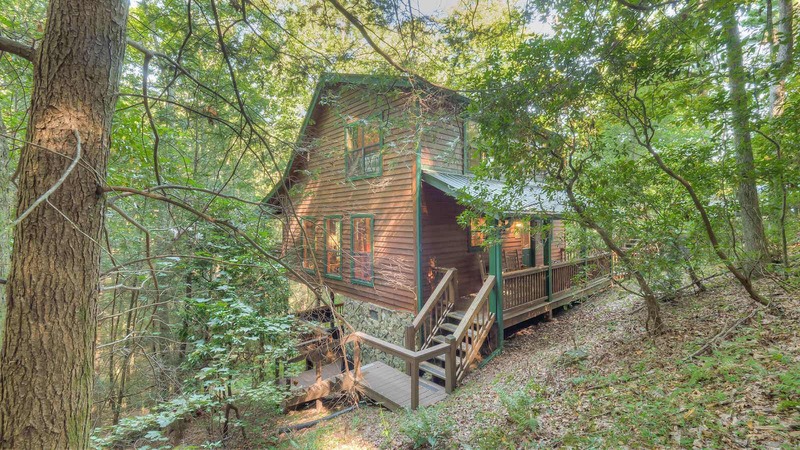 The drive to the cabin itself will get your imagination running wild: you'll wind through a meadow on a gravel road, passing natural mountain springs as you travel through the forest and then arrive at the cabin perched perfectly on the hillside among all the trees! 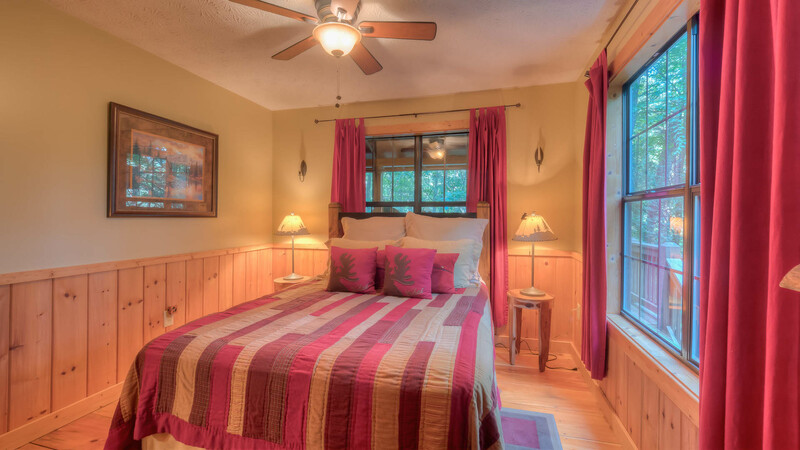 Tree Tops is private and very nicely furnished with two complete levels of living space. 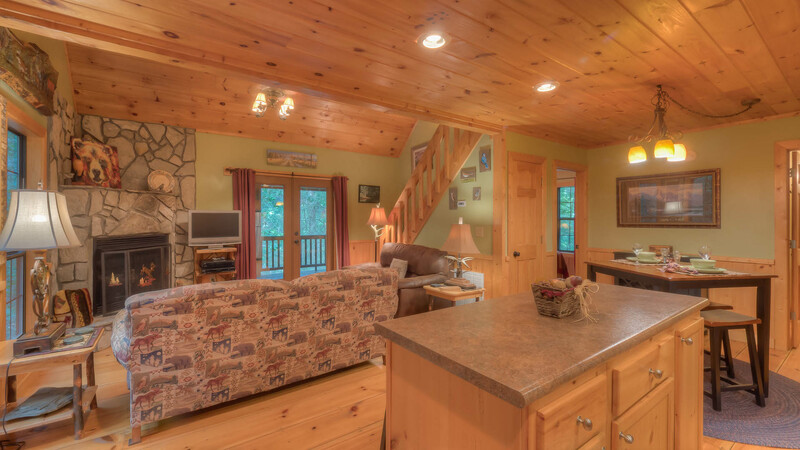 The main level features a greatroom with an upgraded kitchen, dining area and a cozy living area with a flat river stone fireplace with gas logs as the focal point. 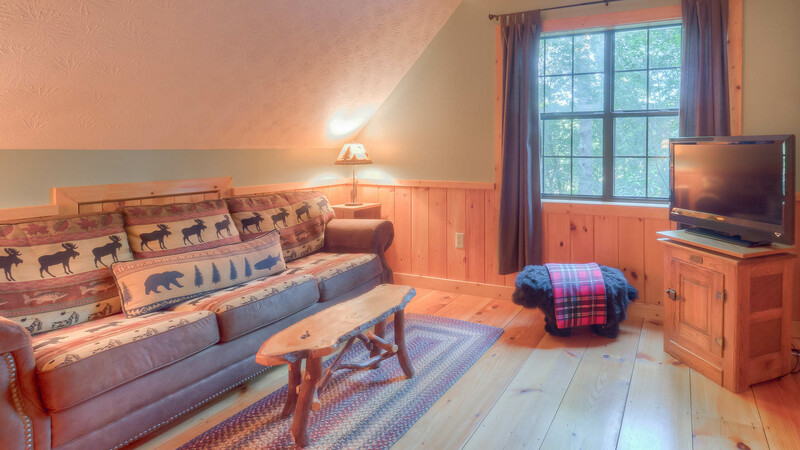 Next to the fireplace you will see one of the four flat panel tvs this cabin has to offer! 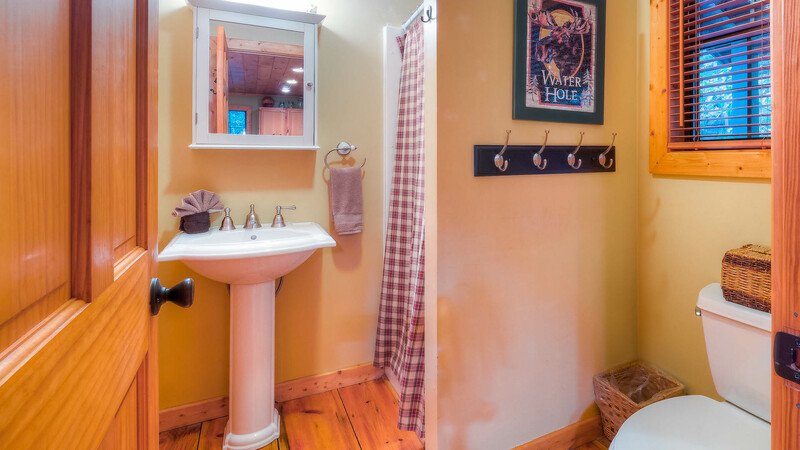 There is one bedroom on the main level with a queen bed and a full bath. 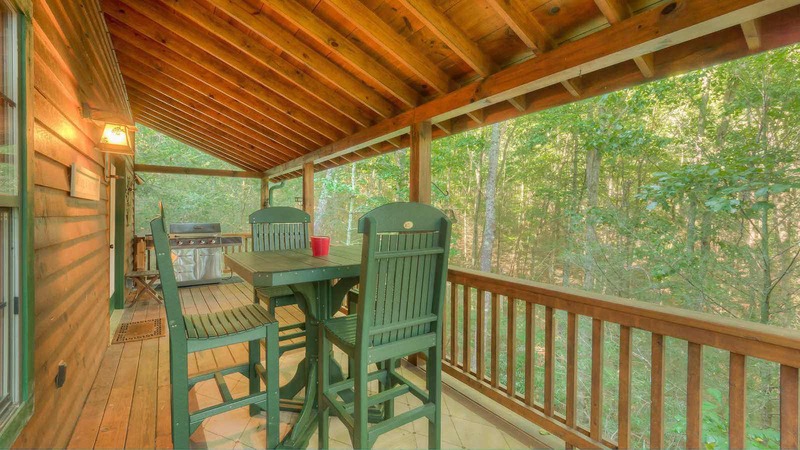 The porch off the main level has a propane grill and an outdoor dining table, perfect for enjoying breakfast in the fresh mountain air. 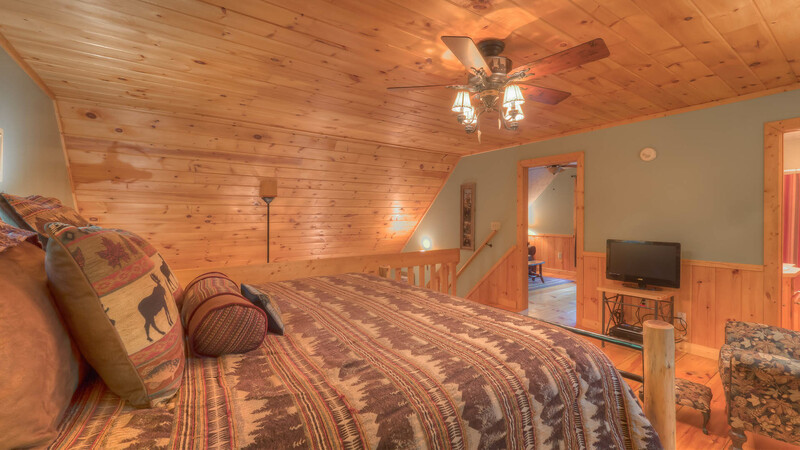 Take a stroll up the stairs inside and you will be welcomed by an open loft with a king bed, flat panel tv and a full bath. 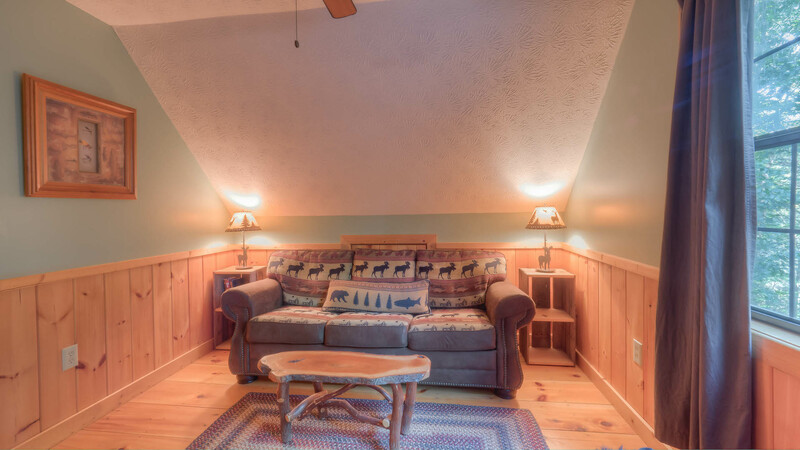 Just off the loft is a private reading room or entertainment room with another flat panel tv and sofa! 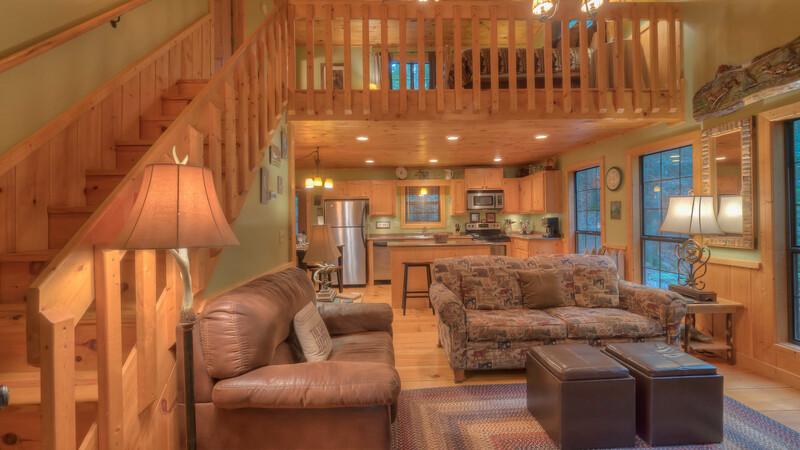 Journey down one of the outside staircases (one staircase on each side of exterior) and you'll find an awesome a large covered porch under the main level porch that boasts a hot tub with the fourth flat panel tv mounted on the wall so that you can view it from the hot tub! 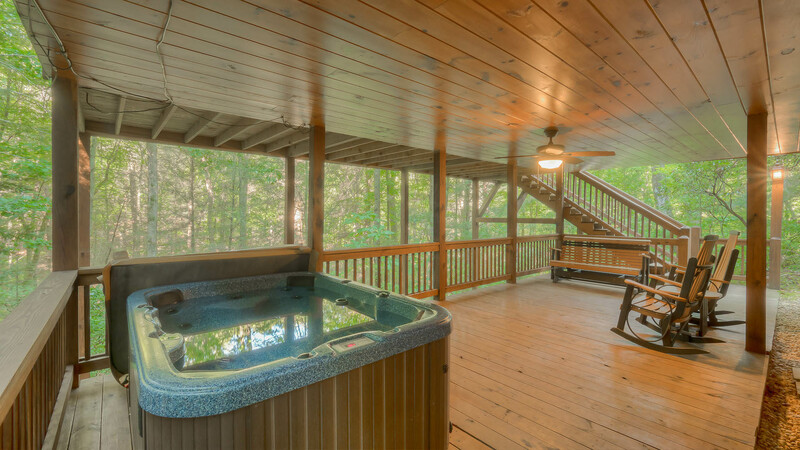 Watch movies or games from the hot tub or set the mood with one of the many music stations! 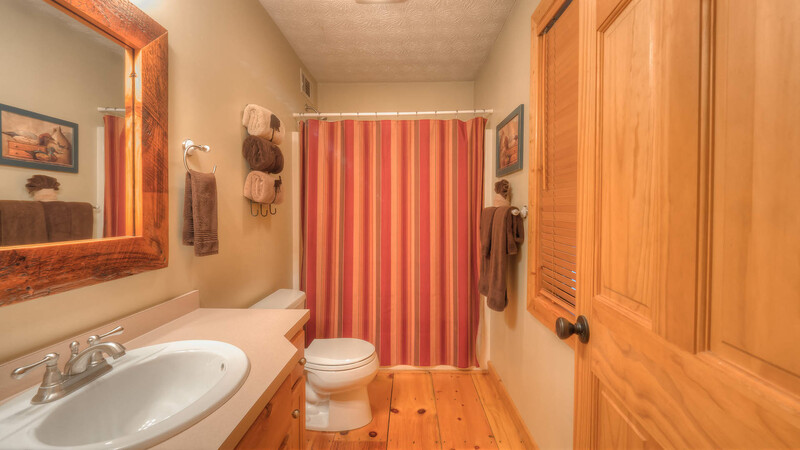 Just think of all the fun memories you could have here! This porch also has a glider made for two. 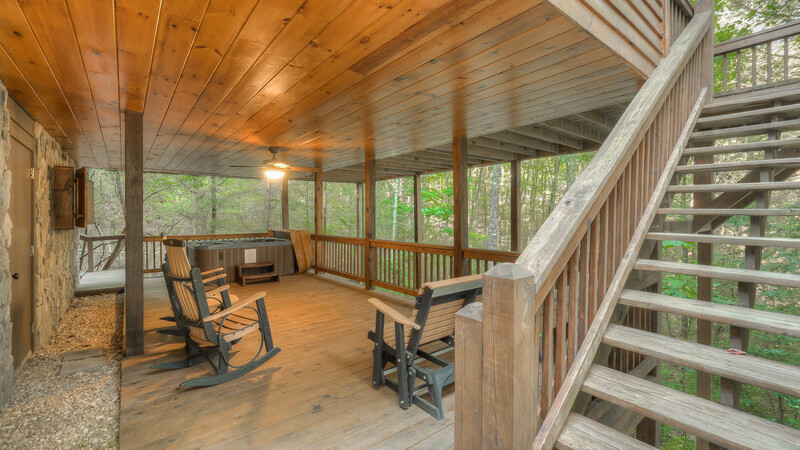 Not only does this party porch have the hot tub, TV and offer a lot of fun, it also offers the perfect place for relaxing. 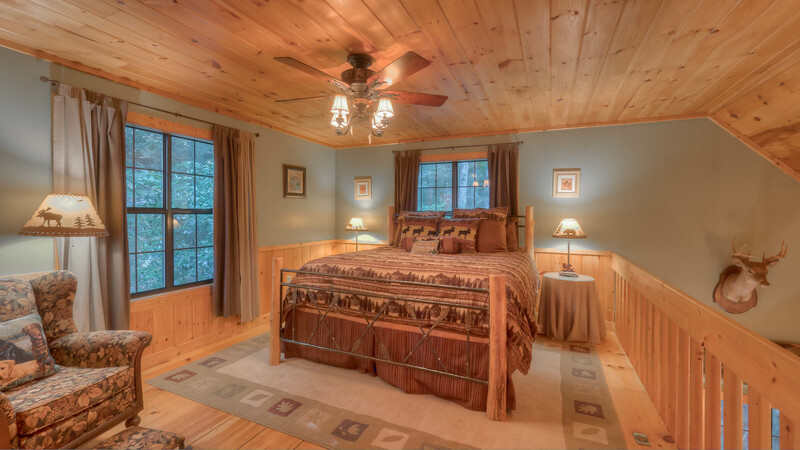 Soak in the hot tub while being enveloped in a natural forest of oak trees, large hemlocks, white pine, mountain laurel and other hardwoods! You cannot find better scenery or a better place to reconnect with nature. 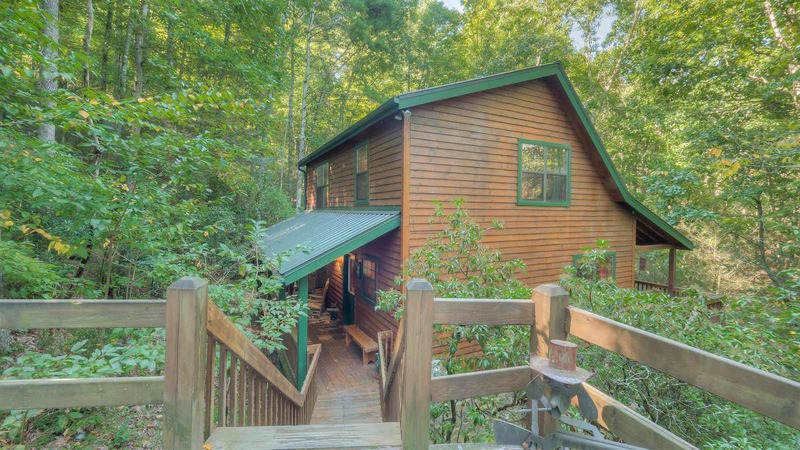 You have found the perfect treehouse in Blue Ridge, at TreeTops!